2018 North American Copper in Architecture Award Nomination - Evans Roofing Company, Inc.Evans Roofing Company, Inc. 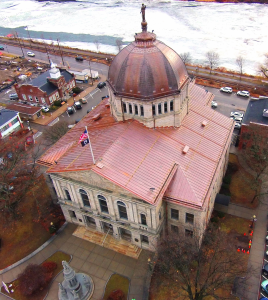 The re-roofing project at the Bradford County Courthouse that was recently completed by the Charles F. Evans Company, Inc. has been nominated for the prestigious 2018 North American Copper in Architecture (NAICA) Awards by the Copper Development Association, Inc. and the Canadian Copper and Brass Development Association! Final judging takes place soon, so check back for updates.